I'm excited to say I finally have a new book review for you! You may or may not remember that I previously read (and reviewed) the follow-up book to this one, Twelve Extraordinary Women, which covers the lives of 12 significant women in the Bible. 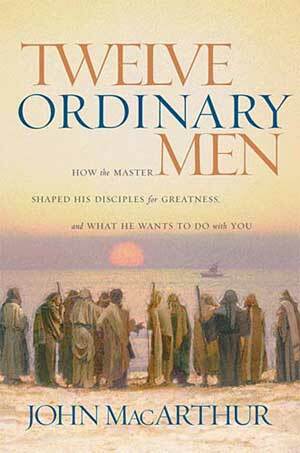 This book came first, and it's about the 12 Disciples (I'd say the 12 Apostles, but it includes Judas, not Paul) and it goes into as much detail as possible about who they were and what they became. One of the things I love about MacArthur is the high view he has of Scripture. In the same way that 12 Extraordinary Women took traditional teachings about the most famous women of the Bible and compared them to Scripture, MacArthur combines both Scriptural evidence and historical record to show us the complete picture of these 12 men, while differentiating between Scriptural/historical evidence and human legend or myth. The theme of the book is the above passage from the Bible: how God makes a point of choosing the ones the world would say are worthless, have no future, no talents or great personal influence - and uses them mightily to change the world. MacArthur shows how Jesus found these incredibly regular guys and made them the best versions of themselves and entrusted them with the most important mission in human history: the mission of establishing His Church on earth. The book provides a lot of encouragement for those of us who see all too easily those aspects of ourselves that seem to limit our potential. I won't go into too much detail, because I don't want to spoil the journey of working through these great profiles for you. But I will say the most memorable chapter for me was the last one - the one about Judas. It is chilling to read about someone who could spend 3 years in the physical presence of Jesus, 24 hours a day, 7 days a week, and not have any genuine change. It should be quite a wake-up call to all of us who have grown up in church. But that's all I'm going to say about that. Anyway, I wasn't as able to get caught up in this one as I was in Twelve Extraordinary Women, but I think there are two reasons for that. One: I read this much more casually than I normally do - no underlining or notating, as is usually my practice with non-fiction books. And two: naturally, it's easier for me to relate to women in the Bible than to men in the Bible. However, I was still able to find certain character aspects of each figure that I could identify with, so I don't think that the male/female gender gap is a problem. In short, I do highly recommend this book and I hope it makes it to your reading list this year. It's definitely worth it. Thanks for the review...I think I'll pick up the one of the women first...I love when people find these books for me!! I think you just helped me find a Christmas gift for someone I know!!! Thanks!